Kids are at the very heart of everything we do at Complete Control. Working with the biggest and best names in the children’s industry to produce high quality digital content is what we have prided ourselves on for the last 17 years. Getting kids involved and ‘hands on’ with our projects from a very early stage is very important to us. 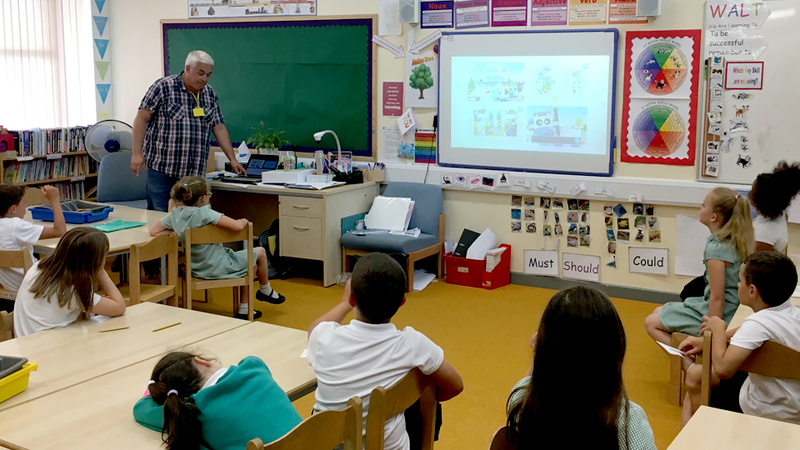 A recent user testing session for our Clarks Gloforms app at one of our local schools led to an invitation to give the pupils a little bit of an insight into how we make games. 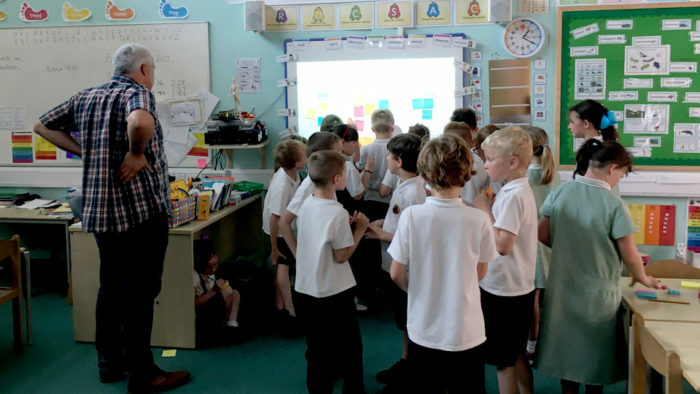 So one sunny Friday afternoon in July, myself (Matt Whatley, Senior Creative) and Anna Pellicci (Senior Account Manager) went ‘back to school’ at St. Keyna Primary School. We prepared an hour long lesson plan which we shared with the year 3 class first, followed by year 4. To make the subject come alive for the kids, the lesson was designed to be as hands on and interactive as possible. After introducing ourselves and what Complete Control do, we played a little logo quiz to see how many of our clients the kids recognised – unsurprisingly they knew all of them instantly. Of course the question ‘how many of you play games and apps’ was answered with the expected unanimous sea of hands, and was followed by a buzz of excitement when we said we’d like to show them how we make them. Rather than having us just tell them about game development, we asked the kids to role play what each of the team members do as they go through the different stages of a project. First we received the brief from the client, then we researched and understood the project, and who we were making it for. 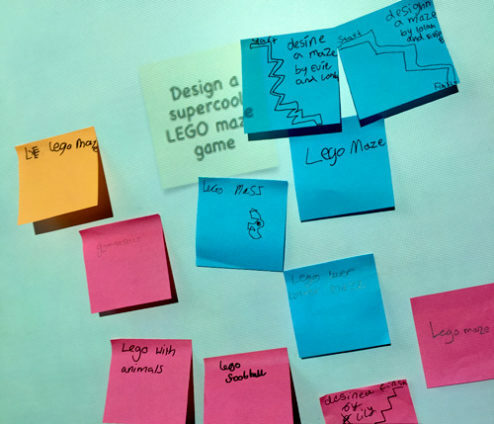 Armed with post-it notes and felt tips, we asked the class to brainstorm game ideas, draw or write them down and stick them on the whiteboard… full of brilliant concepts of course. At this point we presented our game proposal back to the client… who loved it. Once approved, it was the turn of the designer, animator and sound engineer to create all of the different elements and assets needed to make the game. These assets were then handed over to the developers to build the game using code. Now we had a finished game, it was then passed onto the QA manager and the beta testers to play and find any bugs or glitches that needed to be fixed. With a completed and tested game, plus a happy client, we put the game LIVE onto the web for everyone to play and enjoy. Now it was the turn of the kids to try out this game we had just ‘made’. 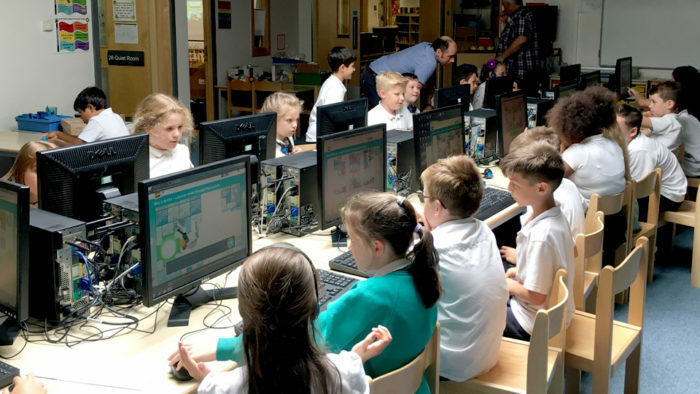 We set-up our award winning LEGO® Bits & Bricks game on the school’s computers and got the kids to pair up to solve the puzzles and see how many levels they could complete. LEGO® Bits & Bricks is designed to give kids aged 6-9 an outline understanding of code and programming through playing a game – a technique that LEGO® call ‘Learning Through Play’. Both classes really enjoyed playing the game and it was brilliant to see so many of them grasping the concept so quickly and really enjoying a game that we are very proud to have created – it makes all our hard work so worthwhile. Anna and myself had such a fun time with the kids and Complete Control are really looking forward to doing similar sessions on a regular basis. It gave us even more respect for the brilliant teachers and the awesome job they do teaching our children. Doing what we did for just two hours was exhausting – let alone doing it all day, every day. Finally we’d like to say a massive thank you to Mr. Eaton, Mrs. Norman, Mrs. Morris and the amazing children of Jade and Topaz classes at St. Keyna Primary School. We really appreciate you letting us come in and tell you a little bit about making games. We hope you had loads of fun – we certainly did.